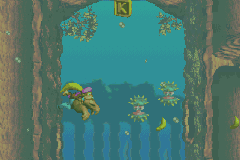 Sunken Spruce is the thirty-third level in Donkey Kong Country 3: Dixie Kong's Double Trouble!, and is only available in the Game Boy Advance remake of the game. It is also the third area of Pacifica. This level is unique, as it's set within a group of huge trees that have sunken into a lake. The level's trees are all hollow, so the monkeys can move freely inside of them. Since part of the spruce trees are underwater, the Kongs find themselves swimming beneath the trees, maneuvering around many Lurchins in the area. The heroes begin their journey here by swimming downwards on one side of the level, and coming back up by criss-crossing through the trees. In the background of this level, a sunken city resembling Atlantis can be seen, rather then having other trees in the background like a normal tree level. Next to Lurchins, Kocos, Bounty Bass, Bazzas, Minkeys, and Buzzes can be found in the sunken spruce trees. When the level begins, the Kongs find themselves on a tree branch above the bright water. Walking into the tree trunk to the left, they head down the area on a short rope and find the exit of the trunk. Once out if the tree, the apes find themselves slightly in the water. If they walk off of the branch, they fall into the lake, meeting a few Lurchins. Swimming below the last exit, they find a round opening into the first tree, which leads them to a completely sunken area of the tree. Slowing and carefully hovering downwards in the trunk, they pass some Kocos and soon find another opening to the right. If they go through this opening, they enter an area outside of the tree, full of many more Lurchins, as well as the letter K. After swimming through another passage nearby, the heroes make their way into a different tree, where they pass a few Bounty Basses. At the bottom of the area, they can see a pathway into the neighboring tree. They must take this route and enter the spruce, heading downwards. Once they pass the many Lurchins scattered all around the area, they make their way out of the tree and swim in a U shape around a short branch. After they pass through the nearest opening, they arrive in an area full of Bazzas, crossing between the two sides of the tree. The Kongs have to exit the tree at its lowest point and travel through a small space outside of the level's two trees. Entering the second tree, the group dodge some rapidly moving Lurchins and find the way between a third tree through a small opening. They must swim diagonally in this space, following a small trail of bananas, to enter the next tree, where they find the Star Barrel. About halfway into the level, the monkeys begin to travel upwards through the level. After exiting the trunk of the third tree, they swim through a small area occupied by two Lurchins. On the other end of this area, they find a small opening, leading into the fourth three. Heading north in this tree, they pass a few schools of Bazzas until they reach the top part of the area. At this point, the group need to leave the tree by using a small opening, however, a school of Bazzas infest much of the space inside of the hole. Sneaking between two of the Bazzas, they should be able to get through and cross back into the third tree. In this tree, the apes follow a banana trail around the bend and exit the tree to find another area with some Lurchins. Swimming between the two Lurchins takes them inside of the fourth tree again, where they swim upwards and avoid Kocos and Bounty Basses. After going through the tree's next exit, Dixie Kong and Kiddy Kong head downwards and maneuver around some more Lurchins until they arrive back in the third tree. In this tree, they dodge some Kocos and find another opening at the bottom of the trunk. Going through the passage, they find themselves in the area between two trees. If they float between two Kocos there, they notice an upwards path through the second tree. There, they must dodge a few more underwater enemies and come up to the letter N. Once the item is obtained, they must swim to the surface of the water, where they climb up a rope. At the top of the tightrope, the heroes find a pathway between two trees. Inside the neighboring tree, they spot another opening, leading into a small area infested with two green Buzzes flying in a circle. If they manage to get out of this area and enter the next tree, they need to climb up another rope to access a higher part of the level. In this space, they find the letter G high in the air, as well as the way outside of the tree. There, the monkeys stand on two strong branches near a flagpole. Raising the pole's flag ends the level. After the Star Barrel, the monkeys enter an area in the fourth tree, where they meet a school of Bazzas swimming through a small opening. If the monkeys swim between the Bazzas in the opening, they enter the third tree. Still on the level's main path, they find a trail of bananas leading out of the tree. The apes must ignore the bananas and continue upwards, passing a group of three Kocos. After passing the enemies, they find a Bonus Barrel. It takes them to a Bonus Level, where they need to swim through the underwater trees, collecting seventy-five stars. Once all the stars are collected, a Bonus Coin appears in the bottom-right part of the stage. Not too long after the letter N, the heroes find their way out of the water. Once they get back on the dry part of the spruce trees, they cross into another tree. There, they find a vertical tightrope leading into the water. If they climb down the rope and swim through the liquid, they find a hole leading into an area between two trees. There, they find a Bonus Barrel, which guides them into a Bonus Level if they get in it. In this Bonus Level, they swim between two other trees, dodging several schools of Bazzas. At the top of the area, they find an opening, leading into a tree. In this tree, they fall downwards underwater and dodge the Bazzas again as they cross into the tree. At the bottom of the trunk, the heroes find a Bonus Coin. At the beginning of the level, the heroes find a Steel Barrel right next to them. They must carry this barrel through the nearest tree trunk and head to the branch stretching into the water. There, they meet the Koin, who has the DK Coin. The enemy's shield protects him from most attacks, so, there's no way to defeat him without the Steel Barrel. So, with the barrel in their hands, they must stand on the foe, distracting the Kremling from anything around it. If they throw the barrel at a wall to the left, it will bounce back and hit the distracted enemy. This defeats the Koin, thus giving the Kongs the DK Coin. This page was last edited on April 10, 2019, at 13:45.